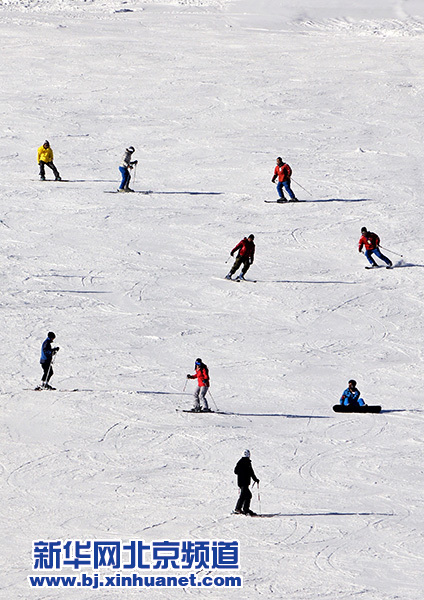 A lot of Beijing residents went to ski resorts in the Yanqing District of Beijing and Zhangjiakou City of Hebei Province to enjoy the great fun of ice sports on the New Year's Day holiday. More citizens are engaging in ice sports this winter. The two large-scale ski resorts have received nearly 50,000 people in the first month since they opened in December, setting a new record in history. Ice sports have been more popular since Beijing and Zhangjiakou successfully won the bid to co-host the 2022 Winter Olympic Games. A number of winter sports events are underway in the capital city. The First Mass Ice and Snow Sports Competition, which kicked off on Dec. 12 of 2015, will run until the end of January. The 7th Bird's Nest Ice and Snow Festival is expected to draw more than 100,000 participants. The 2022 Games will attract 300 million Chinese people to winter sports.